It's finally happening: A Red Dead Redemption sequel is on the way (though I almost wish it were this instead). After a lengthy hiatus, Rockstar is heading back to the Old West. But where can they take the series next? Quick spoiler alert before I continue: I'll be talking about the end of Red Dead Redemption. Proceed at your own risk. When we last left John Marston, he had posthumously left the family business in the hands of his son, having perished in a bloody last stand at the hands of the government. His had been a tale of redemption as he tried to make amends for his outlaw lifestyle. But in the end, he couldn't escape his past. Marston's death leaves the series at a bit of an impasse. One of Red Dead Redemption's major themes was the death of the Old West, and it was filled with imagery suggesting that the book had been closed on people like Marston. Remember the minigun? That was only the tip of the iceberg. Red Dead Redemption concludes in 1914—the first year of World War I. There's not a lot of fertile ground there for a series set in the Wild West. So, as most people are speculation, it will probably go backward—to the days when John Marston was still an outlaw running with Dutch van der Linde, one Red Dead Redemption's major antagonists. Rockstar has added fuel to the fire by posting a second teaser image featuring a group of gang members. As Marston explained in Red Dead Redemption, Dutch's gang styled themselves as Robin Hood outlaws who would steal from the rich and give to the poor. They told themselves that they were making a difference, but they were mostly there to rob, kidnap, and otherwise wreak havoc across the frontier. The criminal who thinks he's one of the good guys but it slowly corrupted is one of Rockstar's favorite themes—see Grand Theft Auto IV—and one that they could perhaps do more justice to in a hypothetical Red Dead sequel. Such an approach would also make sense in light of the advances made by Grand Theft Auto V. GTA V notably starred three protagonists scattered throughout Los Santos—a feature that could plausibly be expanded to encompass the seven characters in Rockstar's teaser image. It was also lauded for its heists, which were consistently cited as one of its best features. When planning a heist, you would determine what approach you would take (stealthy or guns blazing), hire operatives to give you a hand, and perform several setup missions before finally executing the grand finale, which was almost always immensely satisfying. This structure would mesh rather nicely with a hypothetical prequel in which you robbed trains and other high-profile Old West targets. In fact, it's almost too perfect. It's obvious that I wouldn't be surprised if Rockstar decided to surprise us with something completely different. For all we know, John Marston won't feature in Red Dead Redemption 2 at all, which wouldn't be shocking in light of Rockstar's tendency to create new characters for their games. Maybe Rockstar will even exchange black hats for white hats, and your crew will be akin to the Magnificent Seven. Hell, maybe they'll all be robots. Whatever approach they decide to take, I hope they are faithful to the spirit of the original, with all of its crazy frontier folk, persistent hangings, and ninja cougars. 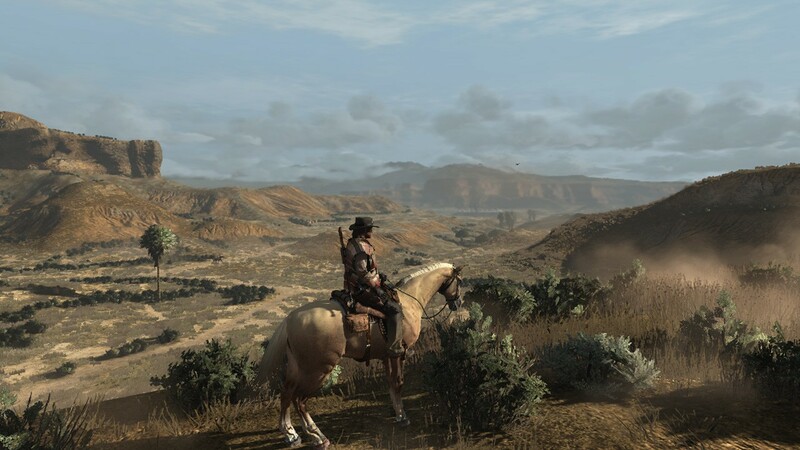 Absent the jaunt through Mexico, Red Dead Redemption's frontier really was a treat. I look forward to going back. Can Red Dead Redemption 2 recapture the magic of the original? No matter where Rockstar takes their much-anticipated sequel, they face a tough challenge: living up to the novelty and majesty of the original game. Red Dead Redemption is widely considered Rockstar's magnum opus, and for good reason—it was subtler and smarter than its modern day counterpart, utilizing its historical setting to great effect. It is in many respects gaming's definitive western. Red Dead Redemption's appeal was in its beautiful and lonely landscapes, its harsh and unforgiving wildlife, and its often rather creepy sidestories (spoiler: everyone living in the frontier is evidently crazy). There was also a lot to do. Poker, for instance, was a shockingly addictive way to while away the hours. Its lack of density was ultimately a strength, as the world felt more organic—the closed buildings common to GTA were much less noticeable in Red Dead Redemption. The area where it could use the most improvement is in its pacing. Red Dead Redemption was rife with long, boring shootouts, particularly in the Mexico section of the game. It felt a little more padded out than it probably should have, so hopefully the sequel will be tighter. Heists should help in that regard, assuming they make it in the game. Criticism aside, I'm a much bigger fan of the Red Dead universe than GTA. Rockstar likes to go big, bold, and crass with GTA, making the lighter touch they've demonstrated with Red Dead Redemption a breath of fresh air. If I buy any Rockstar game, it'll be this one. As always, Rockstar will keep their plans for Red Dead Redemption 2 close to their chest, building anticipation with a slow drip of information. With the release date currently slated for 2017, they may not show their hand until next year. It'll be a long wait. Tagged with Articles,	open-world,	PlayStation 4,	Rockstar Games,	USgamer,	Xbox Consoles.